Two Badin High School seniors have been named Commended Students in the 2019 National Merit Scholarship Program. 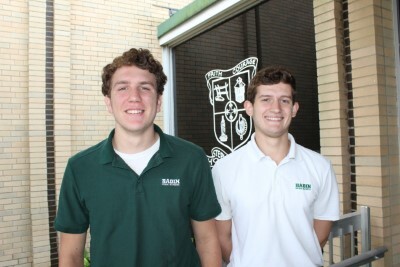 Seniors John Berg and Simon Hoppa scored in the top five percent of the more than 1.6 million students who entered the 2019 scholarship competition by taking the 2017 Preliminary SAT/National Merit Scholarship Qualifying Test. While they will not continue in the 2019 competition for National Merit awards, they are among only 34,000 students in the country who will receive a letter of commendation from the National Merit Scholarship Corporation recognizing their excellent performance on the test. Badin senior Cullen Gantenberg had previously been recognized as a semifinalist in the 2017 National Merit Scholarship competition. John Berg is the son of David and Cecelia Berg of Oxford and a graduate of Queen of Peace School. He is planning to major in International Relations and his top college choices include Notre Dame, Georgetown and Boston College. Simon Hoppa is the son of Jason and Laura Hoppa of West Chester Township and a graduate of Mother Teresa Catholic Elementary School. He plans to major in Mechanical Engineering, with his top college choices being Ohio State, Purdue and Notre Dame.